What is happening with bitcoin?! Almost a year ago, bitcoin was mooning and hit an all-time high of almost $20,000! Some of you all were probably feeling great then. Maybe even shopping for a Lambo or a Birkin bag. But just like when Kanye interrupted Taylor Swift, it was downhill from there. Recently, bitcoin’s price dropped below $4,000, an 80% drop from its peak. The members of the Bitcoin Hater Army have been activated online and are now out in full force chanting the death of bitcoin. Bitcoin’s death has been called many times. But is bitcoin finally on its last legs? Is its death like “for real for real” this time? Let’s take a look at some of its fundamentals. The total number of Bitcoin transactions has increased over 30% over the past year. There are now over 360 million Bitcoin transactions compared to 276 million transactions from 12 months ago. The number of confirmed Bitcoin transactions per day has been steadily increasing since this past July. Bitcoin transactions dropped like a rock at the start of the year but have been on an uptrend since July. Based on a 7-day moving average, confirmed Bitcoin transactions are now back above 250,000 per day. A level not seen since late January. The number of Bitcoin blockchain wallet users increased over 62% over the past year. To hold bitcoins, you need a wallet. A bitcoin wallet is a software program that stores the record (the private key) of every bitcoin you own. According to blockchain.com, there are now over 31 million wallets compared to 19 million wallets twelve months ago. If nobody wants bitcoins anymore, then why are wallets increasing? The hash rate has increased by 300% in the past year. The hash rate of the Bitcoin network, which represents the amount of computing power used to secure Bitcoin’s blockchain, has continued to rise even though bitcoin’s price has been falling. When the price of bitcoin falls, mining revenue falls, which forces miners to have to decide where to continue or quit mining since less revenue means less money to cover mining costs. Fewer miners usually mean the hash rate should fall. But that hasn’t been the case. The hash rate is actually near its all-time highs. Given how much bitcoin’s price has plummeted, why hasn’t the hash rate plummeted as well? For most of the year, the hash rate kept going up, while bitcoin was going down! Miners are still willing to spend resources and mine. If bitcoin is dead, why continue to mine it? Bitcoin’s fundamentals are still looking solid. Rather than dying soon, it looks like bitcoin is here to stay. So when you hear or read stuff from bitcoin haters, just shake it off. Will Bitcoin’s Price Continue to Go Down? 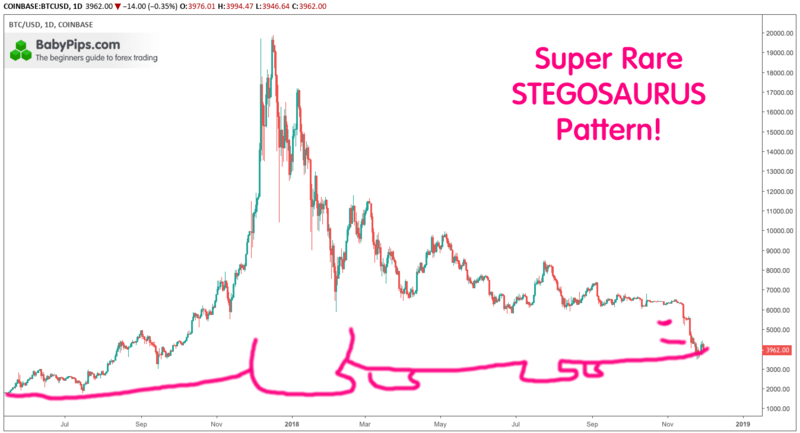 When this pattern forms, price can head in either direction. So be careful out there! If you find that trading bitcoin and other cryptocurrencies are a little bit too crazy for you at the moment, you can always trade traditional currencies, also known as trading forex! If you’re new to forex trading, you can learn more at our School of Pipsolgy, our free online trading course.